Increased collection of value added tax (VAT) helped government mobilise nearly K23 billion more than the mid-year target of K470.8 billion. Minister of Finance, Economic Planning and Development Goodall Gondwe said Malawi Revenue Authority (MRA) raised K493.6 billion due to over-performance of VAT and Pay As You Earn (Paye) tax lines. MRA collected Paye amounting to K128.7 billion against a target of K121.9 billion while domestic VAT at K84.1 billion surpassed its target by K9 billion. In an interview with Business News on Wednesday, the minister said over-performance of tax revenue was undermined the poor performance of the non-tax revenue and grants which were reduced by K11.8 billion or 36.7 percent. Gondwe said most government enterprises failed to meet their projections except Malawi Communications Regulatory Authority (Macra). He said the shortfall came about mainly because under-performance in revenue generation from passports, drivers’ licences and other services offered by government and its departments. On non-tax revenue underperformance, Gondwe said most government enterprises did not deliver as expected in the period under review. “I don’t even count parastatals in all these, they are not performing well,” said Gondwe. 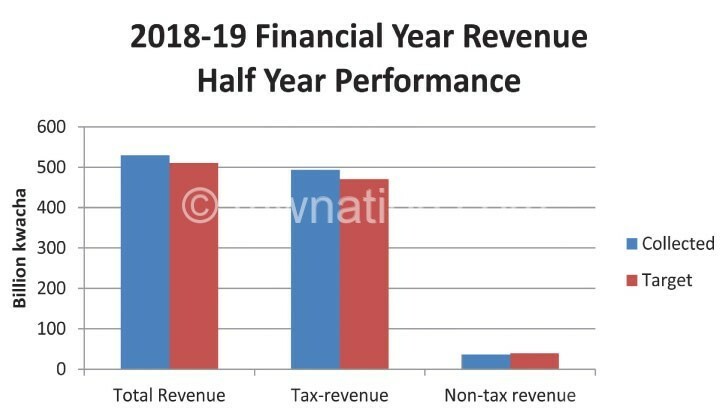 Figures from Ministry of Finance, Economic Planning and Development indicate that Treasury beat its revenue projections for the first half of the 2018/19 Financial Year by K19.6 billion, collecting K529.9 billion against a target ofK510.3 billion for both tax and non tax revenues. Non-tax revenue on the other hand fell short by K3.7 billion, collecting K35.8 billion against a midyear target of K39.5 billion. The development comes against a background of MRA missing its revenue collection targets in the 2017/18 financial year. Commenting on the surplus registered by MRA, tax expert Emmanuel Kaluluma said this means that the tax authority has become more efficient, hence the improvement in revenue collection. “The tax authorities were failing to collect some revenue because of some inefficiency, but they have now managed to collect, and these were like arrears. There is also a lot of tax gaps because of non- compliance, the improvement means they have now pushed some of these into the tax net,” he said.